Wolverine bed and breakfast travel guide for romantic, historic and adventure b&b's. 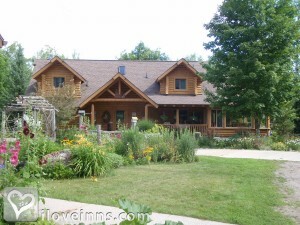 Browse through the iLoveInns.com database of Wolverine, Michigan bed and breakfasts and country inns to find detailed listings that include room rates, special deals and area activities. You can click on the 'check rates and availability' button to contact the innkeeper. Wolverine is in Cheboygan County, Michigan. Wolverine has become one of northern Michigan's top vacation destinations and among the top attractions are the Mackinac Islands as well as the bridge that connects it to Wolverine, the Pigeon River Forest, Ocqeuoc Falls, and Cross in the Woods. Just driving along wooded areas, visitors often catch a view of elks that abound in the area. The Pigeon River is also a favorite when it comes to fly fishing, canoeing and kayaking. Wolverine bed and breakfast inns can be found near most of the attractions mentioned. By Silent Sport Lodge.